1. Like I said last week with the cat cafe, I love a cleaver solution to tough problems. Could tiny homes be part of the solution to homelessness? 2. Manatees are cute. This story is cute. If you don’t think so then I’m sorry to inform you, but you have no soul. 3. This video isn’t new, but it popped up randomly on my news feed this week and I think it was a sign that I needed to share it because its worth watching multiple times. 4. You have until January 31st to bring your old jeans to J. Crew to get $20 off on your next denim purchase. The donated jeans go to Blue Jean Go Green which uses the recycled denim to make building insulation, which is so cool. 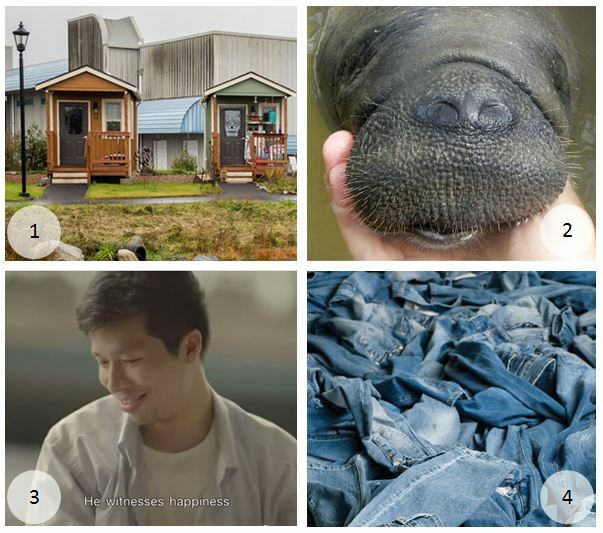 Categories: Uncategorized | Tags: Animals, Cute, Denim, fashion, Friday Finds, Go Green, Green Initiative, Happiness, Homelessness, Inspiration, J Crew, Jeans, Lifestyle, Manatees, Oregon, Rescue, Socially Conscious, Tiny Homes, YouTube | Permalink. Ya, I saw that video, but it was nice to watch it again. 🙂 Have a wonderful weekend.